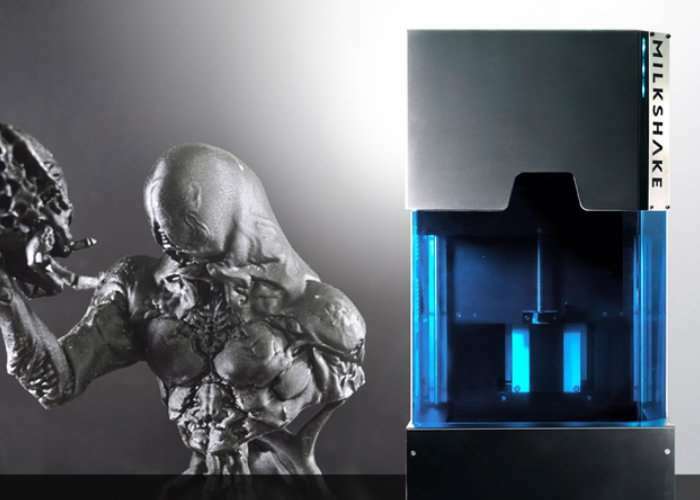 Orbi Lab has created a new 3D printer which has been specifically created for artists and provides the ability to create small pieces of jewellery to 11 inch figures from a single machine. The Milkshake3D offer is a large SLA top-down 3D printing process that is highly stable fast and provides users with a high resolution as well as web control on almost any platform whether it be a mobile OS or desktop device. Watch the video below to learn more about the Milkshake3D 3D printer which is taken to Kickstarter this week to raise the required funds the team needs to take their product into production. – Out of gravity and strong peeling force from common bottom up printer, no worry of model falling down or break apart during print. With Milkshake3D top down printing, the build panel always dip steadily. – For every print layer, the wiper system maintains always the smoothest surface and refill resin for print area, astonishing result especially for large print surface. – With DLP projection technology, printing time depends on model’s height. With our exclusively large build platform, batch print as many items as you like all at once. – Web base control on all pc, mac, linux, and mobile devices. Activate control on any smart phones, tablet using QR code. Nothing to install. – Resin has all different properties and exposure time. We have fully tested with FunToDo’s resin and have integrated the best print settings for you. Simply upload your model, choose your material and one click to go. Of course, you could also make your own setting as save to presets. – Milkshake3D is a stand alone wi-fi 3D printing hub. You don’t need a workstation bundled with it. It means that everyone in your studio could easily upload models for printing, control the printer or check out printing status.